One only need to go back to August of last year and the Montara spill in Australia’s ecologically sensitive East Timor Sea – which lasted 72 days – to appreciate how hard it is to control these situations. Of course many critics are going back even further; 31 years ago to be exact – and another spill that is eerily similar to the current situation in the gulf. 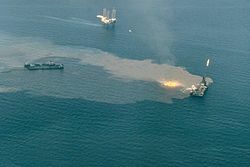 We’re talking of course about the Ixtoc I oil spill, which took place in 1979 off the coast of Mexico. Currently listed as the second largest spill in history, oil from the Ixtoc I poured into the Gulf of Mexico for nearly 10 months until it was finally capped. In fact, a simple search on Google or Wikipedia will produce a lengthy list of oil spills of varying size and scale, some dating back as far as the 1940’s. So let’s be honest here people… NO ONE should be surprised at what we are seeing transpire in the Gulf of Mexico.